Grab your shovel and get ready to go grave digging in Monolith Productions Blood, a rip-roaring 3D adventure that sports the spiffy Duke Nukem 3D Build engine. A zombie is on your fingertips, and dynamite is at your fingertips when the enemies attack  and you fight back! With 3D Realms deciding to not release to game, what can consumers expect? Suffice to say, this game isnt cornstarch with red food coloring. One word can say so much. For some reason, it seems like the designers of all these 3D action games have taken a course in "brash naming." We witnessed our "Doom," then rumbled with the "Quake," and now, will drench ourselves in the 3D world of Blood. However, Blood is much more than hemoglobin soldered onto silicon; rather, its the latest action game to enter the already over-cluttered marketplace of pseudo-3D action adventures with Kinder-Surprise-like goodies such as dynamite and flare guns lining textured geometric shapes. Originally sparked as a developed property for 3D Realms, Blood was one of the two externally-produced 3D games to use 3D Realms and math-equation guru Ken Silvermans blithering fast 3D BUILD engine. The developers, Q Studios, based out of Washington, have been working on the game for over two years  I remember the first version I saw in early 1995 complete with falling rain effects and mine cars. Therefore, it came as a shock when a string of almost too-perfectly timed announcements first mentioned that Monolith Productions, a media company known for the Microsoft Games Samplers, had acquired Q Studios, and in addition, picked up the exclusive rights to Blood. 3D Realms online folks quickly yanked down all mentions of the game from the web site, and had absolutely no comment on why the game was no longer one of their projects. Does the old adage "If you cant say something nice, dont say anything at all" apply here? Both the developer and 3D Realms are relatively mum on the issue of the games sale, but sources at both companies seem to indicate the agreement is best suited for the interests of everyone involved. Nonetheless, with all the legal and business lingo set aside, perhaps the biggest surprise was the fact that Blood, originally pegged as a late 1997 release, is now entering the final stages of testing on track for a Spring release date. Although being released in the Spring, Blood is your archetypal Halloween mystery loaded to the nines with creeks, cracks, and sweeping ambient wind sound effects. However its more than a cheap five cent horror spook ride youd find at the local traveling carnival, as the designers are taking time to develop a main character that looks like Zorro on roids. The syncopated plot involves the archaic fight for freedom from an evil God named Tchernobog and his ancient society of Cabal. How much do you want to bet we wont be seeing many Tchernobog boxer shorts in the near future? Usually, its a key factor of merchandising that you can at least pronounce the darn characters name. Spirited by influences from authors such as Clive Barker and Sam Raimi, the plot, which will be liberally animated using Softimage 3D cut scenes, spans four episodes and over twenty levels of mild-mannered horror as your character fights his way to the top of society  or, more truthfully, clicks the Control or fire button a few thousand times. 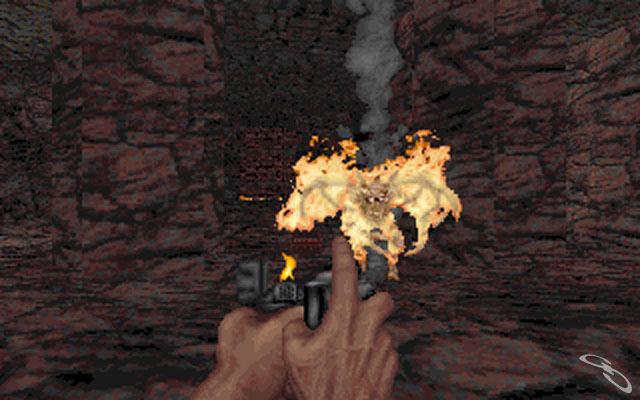 Bloods 3D engine, a so-called "enhanced" version of the Build engine, has a distinct look and feel similar to Duke Nukem 3D  even some of the explosions look almost identical. Blood does have the upper-hand in being able to one-up 3D Realms Shadow Warrior by enhancing the 3D engine with "rooms above rooms" and "3D voxel" spirtes, a bunch of techno jargon that simply means the items in the environment twirl around just like the armor power-ups in Quake. Earth shattering improvements they arent, but the multi-layered rooms do enhance the believability of some of the environments. The strong suit for Blood is, unquestionably, its weapon and enemy design. Previous pixel mongrels in 3D games look like squashed play-doh when compared to some of the enemies, and more importantly, their animation. Take, for instance, the use of the spray can as a weapon, which can be lit on fire to create a flamethrower. Catch a zombie in your fire stream and watch his body erupt in a symphony of flames that spews transparent smoke from his head. These unique touches are carried over to the weapon design that includes a flare gun, sawed-off shotgun, pitchfork, and dynamite sticks. Each of the weapons has a dual fire mode that will, for instance, cause the flare gun bullet to explode into a fireball on impact. Other frills in the weapon section include a John Woo mode  practically double weapons, with one in each hand  and the most exciting weapon, a voodoo doll, which will be held back from the initial shareware release. In the tradition of trying to one-up every other 3D mutiplayer game mode  first we had DeathMatch, then DukeMatch  now the so-called BloodBath uses the same multiplayer technology as Duke Nukem 3D to provide head-to-head combat the crosses land, and sea, but not air. Although the game was originally going to include some variation of a jet pack, the designers scrapped it as they felt the jet pack might remove the need to solve a large portion of the puzzles in the game. On the sound and music front Blood includes a midi music score and a gamut of gut-wrenching sound effects that are perfectly synched to the blood-curdling action. Current plans are to implement a voice for the main character, a la Duke Nukem, but we reserve judgment on this feature until we see the completed package. Suffice to say, the developers have their work cut out for them in differentiating this character from the cult favorite Duke Nukem. As one of the two remaining BUILD-engine games due to be released, Blood certainly has its work cut out for it to hook players onto the gameplay because simply put, the technology doesnt hold a candle to ids polygon-friendly Quake technology. Furthermore, the game has to overcome the hurdle of following in the footsteps of one of the biggest 3D games ever  Duke Nukem 3D. Suffice to say, its not an easy challenge for any game. Nonetheless, the results will be self-evident when consumers take their first glimpse of Blood this Spring. With such innovative weapons and a dash of Stephen King-esque horror, Blood certainly will scrape up the interest of gamers across the world and make Duke Nukems pistol look like a piece of tin compared to the lava-hot flame thrower. Visit the Blood homepage on the Internet or the homepage of the game's creator, Monolith Productions. CompuServe members: Click here to visit our CompuServe area. If you aren't a member of CompuServe, click here to learn how to obtain one month (4 issues of GameSlice) including 10 hours on CompuServe for free!